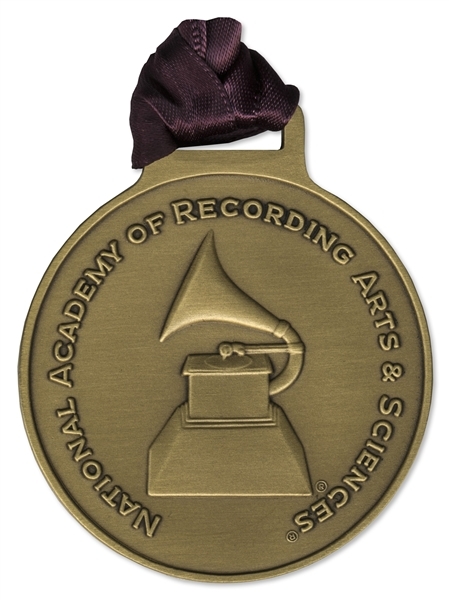 Grammy nomination medal from the 43rd Grammy Awards, held on 21 February 2001. Solid bronze medal by Tiffany & Co. bears the iconic Grammy phonograph symbol on front, circumscribed, ''NATIONAL ACADEMY OF RECORDING ARTS & SCIENCES''. 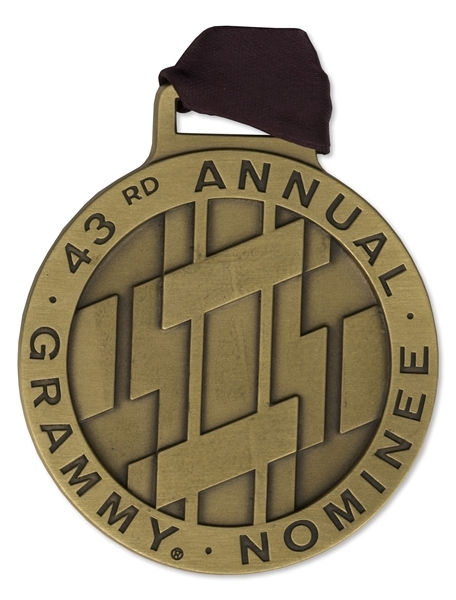 Verso reads ''43RD ANNUAL GRAMMY NOMINEE'' with geometric design in center. Medal is suspended from a rich purple ribbon. ''TIFFANY & CO. BRONZE'' is etched into rim. Medal comes housed inside matted foam presentation which includes Grammy nomination certificate. 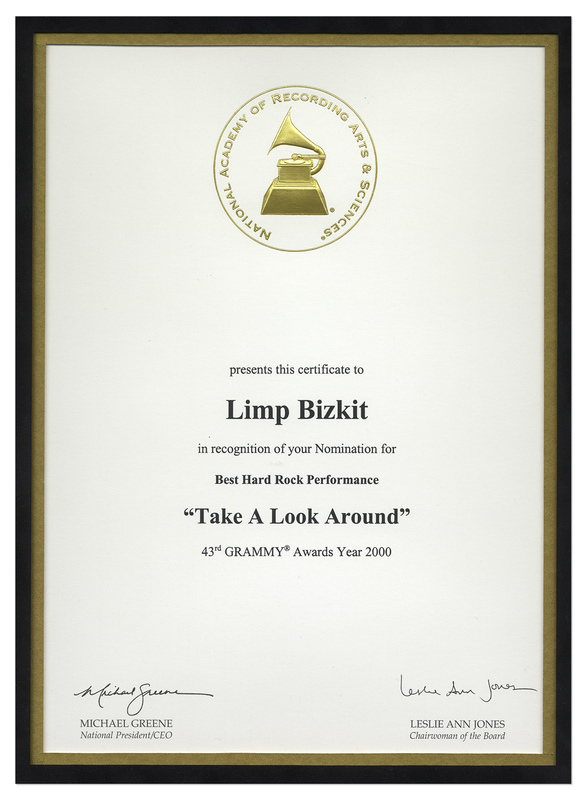 Grammy logo sits atop certificate in gilt, with text reading, ''Limp Bizkit / in recognition of your Nomination for / Best Hard Rock Performance / 'Take a Look Around' / 43rd Grammy Awards Year 2000''. Medal measures 2.25'' in diameter. 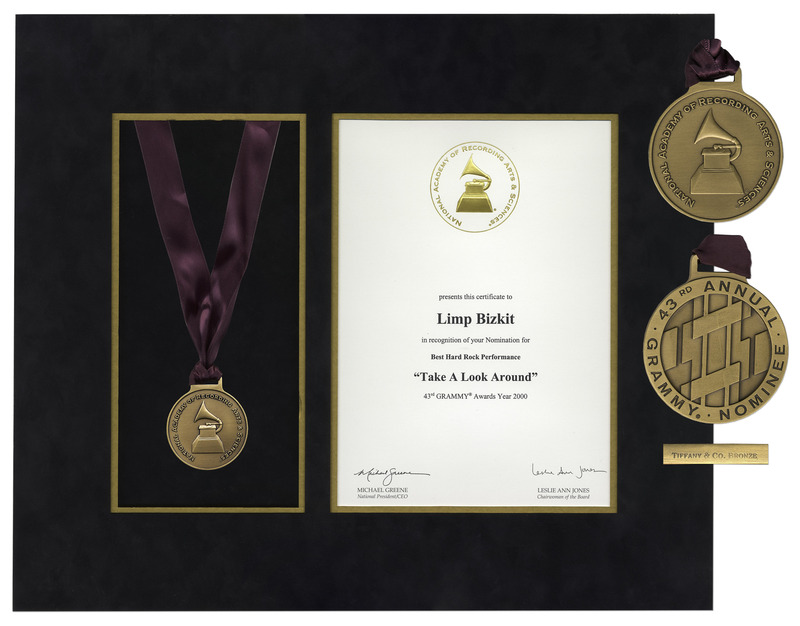 Certificate measures 7.5'' x 10.25''. Presentation measures 19'' x 16''. Medal weighs 92 grams or 3.25 ounces. Near fine condition.